The Trinity Church Archives came about when the parish's historical materials were Identified and collected together in a closet In 1986. Established in 1992, the church's collection includes service bulletins and newsletters that date to 1918, vestry minutes, parish meeting records, membership cards, legal documents architectural drawings, photographs. and much more. Although this collection has been organized several times over the past 121 years, it has not been properly managed to preserve the materials. 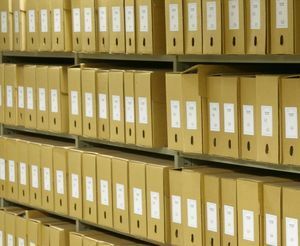 The focus of the archives ministry is to process and organize the materials, and move them into acid-free storage. With care, the archived items will serve the parish as a window into its past for present and future generations.